Technology moves fast, and Sony has never been a company to rest on its laurels. Just under a year ago, we tested the Sony NEX-C3, which was an extremely compact interchangeable lens camera, with an emphasis on ease of use. That compact system camera (CSC) has now been revised and replaced by the NEX-F3, which retails for around £529 in the UK and $599 in the US with the standard 18-55mm f/3.5-5.6 optically stabilised kit lens... So what has changed? Nothing massively obvious has been changed with the APS-C sized CMOS sensor in the NEX-F3. A resolution of 16.1MP is ever so slightly lower than that produced by its predecessor. As a result, Sony has managed to squeeze in a slightly higher maximum sensitivity setting of IS0 16000, which should be handy for shooting in very dark conditions, or for forcing high shutter speeds in less than ideal light. As is the same with other NEX system cameras, the large APS-C sized sensor provides more surface area for detecting light than smaller sensors found in compact cameras and some other CSCs, so it should perform well at high sensitivities, in theory. Beginners and advanced photographers should feel at home with the range of exposure modes offered by the Sony NEX-F3. A wide variety of automatic modes complement the usual manual and semi-manual exposure modes, so this camera should appeal to a wide range of shooters. The NEX-F3 is a little more bulky than the camera it replaces, because Sony has added a deep finger grip to improve handling, as well as a built-in pop up flash. This camera will appeal to demanding users who like the idea of a more compact camera but don't wish to compromise on image quality or exposure control. Although the NEX series of compact system cameras are certainly smaller and lighter than an equivalent DSLR, this camera couldn't really ever be classed as pocketable, unless you have very large pockets. The lightweight magnesium body on its own weighs a svelte 225g, but as this camera uses a relatively large APS-C sized sensor, the lenses themselves are on the big side. Even so, it shouldn't be a burden to carry, even if it is too large for your jacket pocket. An ever-expanding range of lenses are available for the Sony NEX system, including superzoom lenses, fixed primes, macro lenses and even a fisheye converter lens. Owners of Sony and Minolta DSLR lenses can use one of two adaptors to attach lenses to the NEX-F3. The LA-EA1 adaptor enables any lens to be mounted, but only facilitates autofocus with SAM and SSM optics. Older screw-driven lenses can be used with the LA-EA2 adaptor, which includes its own focusing motor. This is great if you have already invested in a range of Sony or Minolta optics. If you enjoy capturing high quality video, you'll find the movie recording capabilities of the Sony NEX-F3 of interest. Full HD video can be captured at up to 25 frames per second in AVCHD format. Unfortunately the ability to attach an external microphone has been reserved for cameras higher up the NEX range. Rivals include the Panasonic Lumix GF5, Olympus PEN E-PL3 and Samsung NX1000. 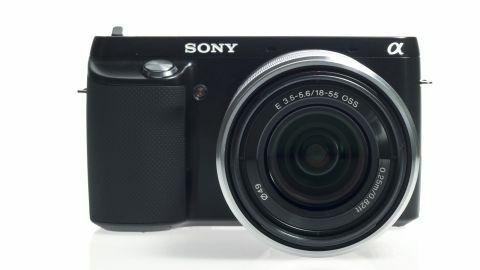 A welcome change on the Sony NEX-F3 over the NEX-C3 is the deep finger grip, which is covered in a textured rubber material. The grip makes the camera much easier to hold, and even though it adds more bulk to the camera, the increased size is a compromise worth making. The black metallic plastics used on the exterior of the camera look smart and durable and the NEX-F3 is still impressively lightweight, tipping the scales at a measly 225g. Controls follow the now familiar NEX layout, with a knurled thumb dial on the rear providing quick access to menus and rapid manual adjustments. A one-touch video recording button located next to the on-off switch is deeply recessed, which should prevent videos being recorded accidentally. Two 'soft' buttons can be remapped manually by the user, to provide quick access to common adjustments, such as ISO, exposure compensation, dynamic range tools or a number of other commonly adjusted features. The ability to set the camera up how you prefer is a great feature of the NEX control system. The 3-inch screen can easily be flipped out by lifting either one of two tabbed areas. As the screen is folded out, a thin, flexible ribbon cable is exposed at the top of the screen. These cables can be very fragile, so seeing this exposed may not inspire confidence in the tilting mechanism's longevity. A 1080mAh NP-FW50 Li-Ion battery, which is standard across the NEX range, provides more than enough power for a typical day's shooting. Shooting a mixture of shots with and without flash, the battery lasted for around 550 shots during testing.